Freezing conditions and chilling winds met runners at a local level when eight Romsey Road Runners took part in the annual Eastleigh 10k, with several of them managing a personal best. Runners completed a single lap through Eastleigh, finishing on the damp grass outside Fleming Park Leisure Centre. Romsey finishers included Ian Ralph 39:45(PB), Wayne Windebank 41:08(PB), Paul Burnage 43:10, Hannah White45:43(PB), Heidi Godfrey 48:29, Christopher Stocks 49:02, Alice Lane 51:49(PB) and Dave Evenden 1:01:31. 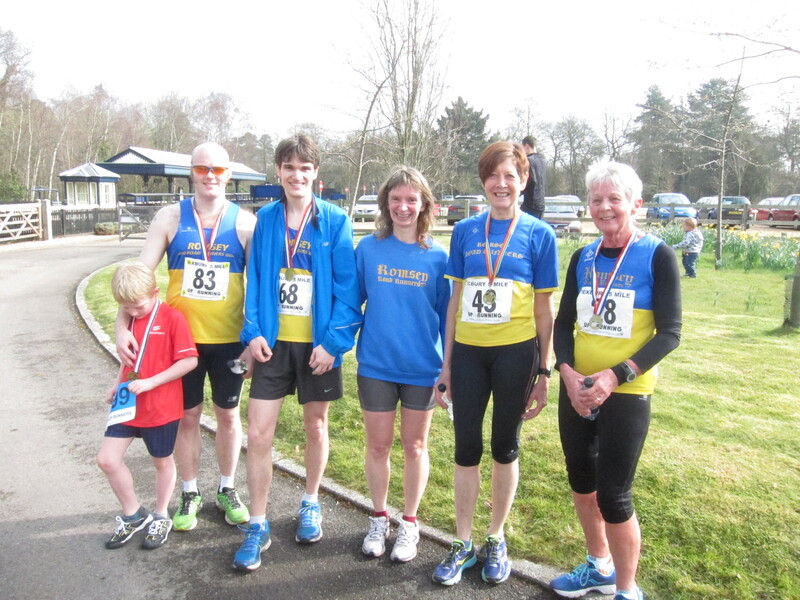 Three RRRs also braved freezing conditions to take part in the Cranleigh 15/21 last Sunday. Lynda Brown and Di Cross, both training for the London Marathon, tackled the 21-mile route, while Mark Adams ran the 15-mile event with Di, leaving her to complete the final six-mile lap on her own. He finished 72nd overall in a time of 2:10:42. Lynda finished 153rd overall in a great time of 2:49:18, she was the 27th woman to complete the course and 11th in category (VW35). Di followed in 3:01:19, 244th overall and 12th in category (VW45). The course consisted of three loops, one of nine miles and then two of six miles. At the end of the first loop, the route led through the town, where a Palm Sunday procession enlivened the proceedings. Runners raced through flurries of snow for the first couple of hours, with a strong easterly wind making it feel a lot colder that the 1ºC forecast. New Romsey member Becky Tovey took part in the Dorney Lake Half Marathon on Saturday 16th March, finishing in 1:53:08. This was Becky’s first half marathon and she finished really comfortably. Amanda Hull equally had a good run, setting a PB, she completed the half in 1:25:51 and came in first lady. This is hosted as an event to prepare athletes for the rigour of the London Marathon. Many seek a fast time to give themselves confidence for the big marathon day. The course is a flat, multi-lap affair, designed in theory to bring about some superfast times. One thing tried it’s best to jeopardise this: the weather! Come the start, the wind and rain ravaged the entire area, brave competitors put their heads down and battled on and some were rewarded with PB’s. Finally, on a lighter note, injured RRR Annie Tomlinson recently participated in the 6th National Wife Carrying Race in Dorking, Surrey. Annie was carried 250 metres up a muddy hill by her husband, whilst he negotiated straw bales and dodged water pistols! Competing under the team name ‘Tears and Tantrums’, the Tomlinson Team finished second to last, blaming the slow start, children and dog in toe for their staggering performance. They received a half keg of beer at the finish, better than a medal and banana any day! Next post Beer Race Entries Open!